Imagine that Australia’s homeland had seen battles in the last world war. That in one battle alone there were 140,000 dead. 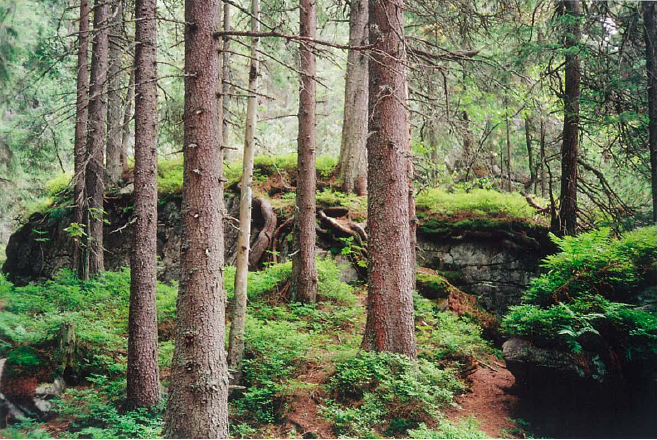 Imagine moreover that many – most – of the bodies had been left in the wilderness. Unburied. Unrecognized. Uncommemmorated. In 1988 the Russians started a movement to see that all such remains would be located, found under the soil and tree deposits of the decades. In the Novgorod region, my source told me, there were about 800,000 killed in the forests and only 400,000 have been found. During the war the region had been in the frontline for about two and a half years: this explains the staggering casualty total. And in the Soviet army there were no burial units. And no time to do this work in the immediate post-war years. Today in summer 1500 young volunteers, pitching tent in nine camps, work in the forests with special metal detectors. They find old craters filled with water and pump them out and filter the mud. If they can identify remains of one soldier they can sometimes identify the others in the area. There had been no metal discs for the Russian troops, just a piece of paper with a name in a plastic cylinder. There could be five to 100 bodies in a crater. Finding hip bones- you need two for a person – is the test of whether they have made a find. In the last 23 years 97,000 remains have been located; of these, 17,000 have been named. There have been cases where remains have been found just before a war widow has died. In July 1942 the Russian Second Army had been surrounded at Myasnoi Bor between Novgorod and Leningrad. 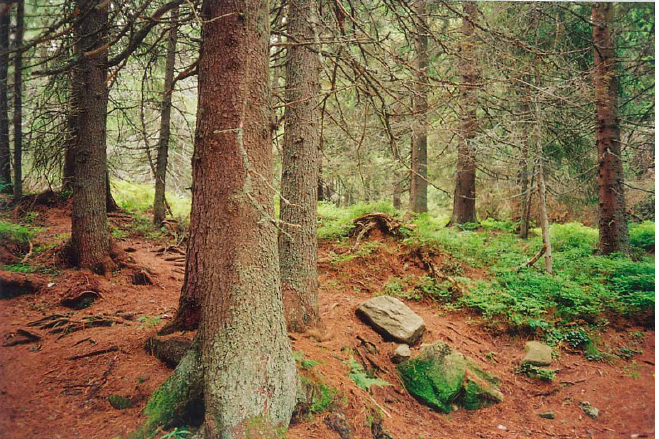 The Germans had isolated them in the forest and they couldn’t fight their way out. There was little bark left on the trees as the starving men clawed it off for food. Several years ago, volunteers found wrapped in plastic, the papers from one army unit. They revealed that one soldier had been arrested for cannibalism but died before he could be tried. General Vlasov, a hero of the Battle of Moscow and a favorite of Stalin’s, had been put in charge of this army when already isolated by the Germans. He was captured and, in a complicated transaction, ended up heading a pro-German front – called the Russian Liberation Army – and late in the war the Nazis made it an actual combat force. He was handed over to the Russians by the Allies and executed at the end of the war. The Russians I spoke to are not inclined to dismiss him as a traitor but to recognize the ambiguities. The defeat was not remotely his doing. If he had been lifted out of the forest, of course he would have been executed by Stalin for losing an army of 100,000. Meanwhile, all these years on, the job of locating the remains of his dead men is taking place every spring and summer. 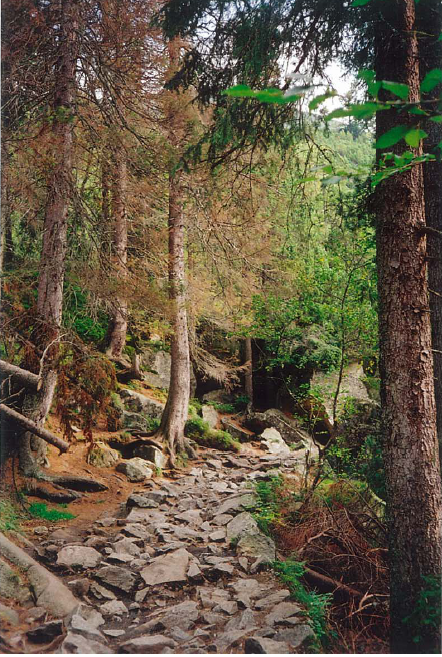 The most remains located in one season by the volunteers was 4000 in 1989. Russia and Germany, and a fierce and terrible one at that. On the return to St Petersburg from Novgorod I stopped at the memorial cemetery, the names of the Russian soldiers killed in this region carved in granite. They had given relief to Leningrad, stopping Hitler levelling the city and killing its people in Babi Yar-style slaughter. Why is the sound so rich? This morning we were taken into the St Petersburg Philharmonia by Vladimir Altshchuler, conductor and teacher. There was the orchestra – on this Sunday morning – rehearsing Tchsikovsky’s Fourth. I had never heard sound so chocolate rich, or subtle and sinewy and full-bodied. Was it this acoustic? Or the playing? The hall had gone up in 1839 as the Noble Assembly, a kind of senate. 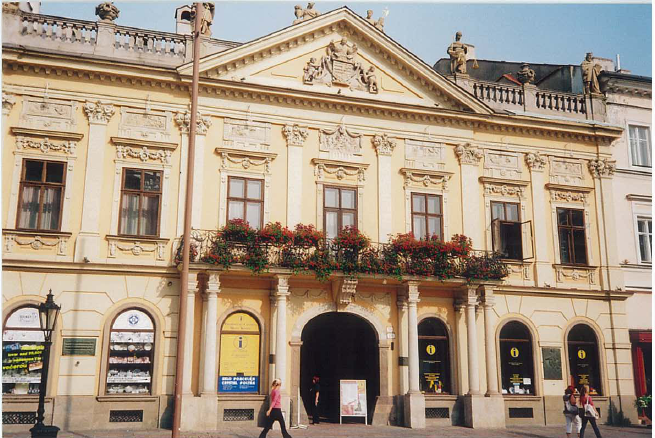 It had become a concert hall before the revolution ; Wagner, Berlioz, Prokofeiv and Shostskovitch were to conduct here. And here Shostskovitch’s Leningrad Symphony had been broadcast in 1942 while 100,000 Russian cannons had blasted the barbarians to keep them in their bunkers and from shelling the hall. Half the orchestra members who played in that concert were to die before the siege was over. Maestro Altschuler told us he lost a brother, all his mother’s family including his grandmother and 40 of their neighbors. He knew Shostskovitch. And these days his music will fill a hall although its tragic tones had once not pulled crowds in ; Tchaikovsky and Rachmanivov always did and still do. With the air vibrating around me I could understand why. 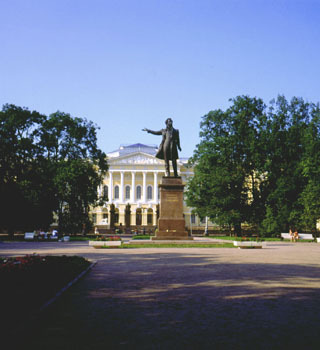 Outside in glorious sunny weather lies Arts Square with its theatres and museums; the little park in front of the Russian Museum, with the yellow and white classic columned facade, is dominated by its bronze statue of Pushkin. 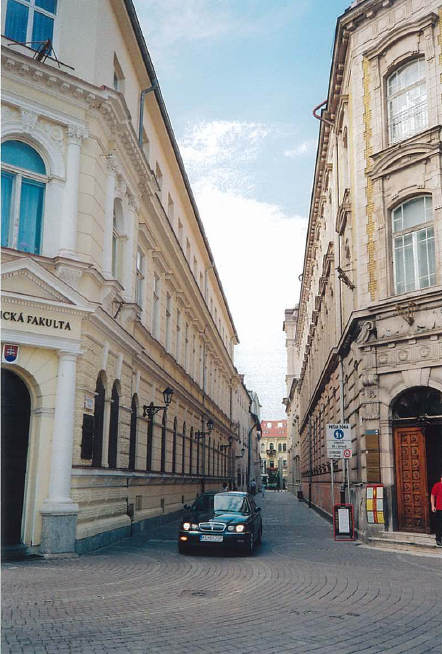 The square is defined by harmonious buildings – all yellow walls and white trimming – and has got to be the most serene and humane of urban ensembles in Europe. As for the Russian Museum, I knew nothing about icon art before I visited their five rooms devoted to the subject. I am now converted – whoa, to the art, that is! The audio guide commentary is easily the best I’ve encounter in an art museum. It explained the theology behind each painting. About the story from the book of Nickodemus,for example (not found in the canonical Bible) that has the resurrected Jesus going to hell to smash its gates and liberate Adam, Eve, David, Solomon, John the Baptist and other of the nomenclature. Couldn’t have decoded that one on my own, I’m afraid. Room after room of the most interesting Russian art without the tramping, dead-eyed tour parties clogging the galleries of The Hermitage. Surikov’s giant canvasses of the feats of Russian survival and expansionism in the nineteenth century are favorites. But the war paintings – especially after my investigation of the Kolkhov front in the Novgorod region – were a treasure. Pimenov’s Frontline Road; Deineka’s Defence of Sebastopole; and Retreat of the Nazis from Novgorod stand out. All the Soviet-era material is fascinating, especially that of the 20s. A gallery of Malevich’s geometric abstractions follows – and I have’t exhausted the riches of this museum. Our Russians took us to three churches and to the necropolis at the Alexander Nevsky monastery: the graves of Borodin, Rimsky Korsokov, Mussorgsky and Tchaikovsky…and that of Dostoevsky. Today we saw the palace of Menshikov, one of Peter the Great’s favorites, built on the Neva from 1710 to the 1720s, only a short distance from Peter’s first work, his fortress of Peter and Paul. It is full of Dutch style and influences. Some rooms are tiled, for example. Some interiors could be out of Vermeer. It is a reminder of all his patron owed to the Dutch. The Emperor had worked in Dutch shipyards on his famous European world tour in 1695 and recruited its seaman to build his navy. Holland was a model in his modernization of Russia. Yet Menshikov was gone within two years of Peter’s death in 1725. He was the son of a stablehand and the aristocrats kicked him out of this palace at the first chance. He spent the last eight years living as a peasant. His was one of the most dramatic rags to riches and then to rags stories in European history. 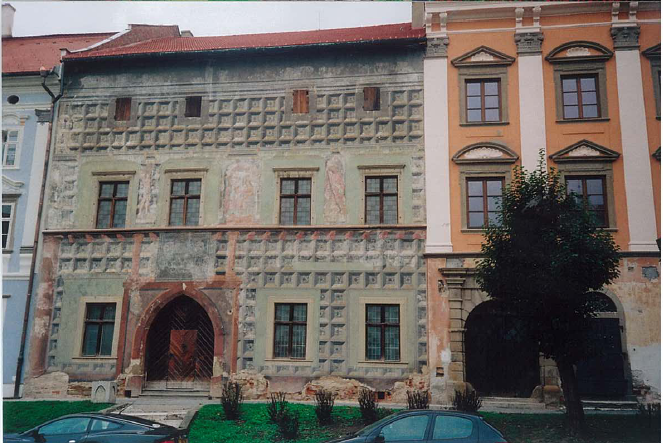 In design and architecture this early eighteenth century, riverfront Petrine palace is unique. My thoughts go back to this morning in the concert hall. Has there ever been a artistic invention to rival the nineteenth century symphony orchestra? I should confess I’ve just bought some CDs and Tchaikovsky’s fourth is filling the hotel room as I write this. Conducted by Yevgeny Mravinsky, a great of the Leningrad Symphony orchestra. Yes, music is a religion here and I think I’m signing up. 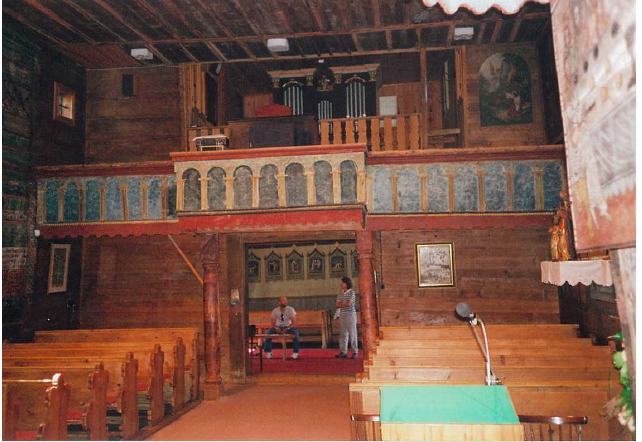 On our way to Staraya Russa, driving south of Novrogod, we came across a log cabin roadside palace built for the travelling Alexander 1, then a church built by Catherine the Great and, last, a German World War Two cemetery – all around the tiny village of Korostyn by Lake Ilman. 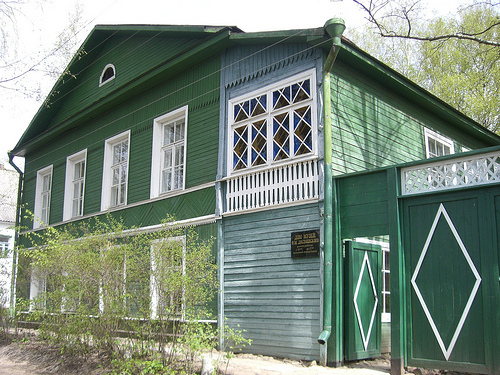 Then in Staraya, population 30,000, we found ourselves in the two storey timber house where Dostoevsky had written seven of the 12 books of Brothers Karamazov, staying here April to October each year from 1872 to 1880,just before his death. With photos of the children, prints of his favorite sites and of his favorite authors (Pushkin, Dickens, Balzac and Shakespeare) and an icon titled “Joy of all grieving people”. Parts of this house he put into his description of old Karamazov’s house.The house that inspired that of Grushchenka is on the other side of the river and the route that Dmitri took after the murder can be traced through the town. We visited the little Church of St George where his much loved son Alyosha was baptized and whose priest was a close friend and adviser. The priest’s photo, too, is on the wall of the sitting room. 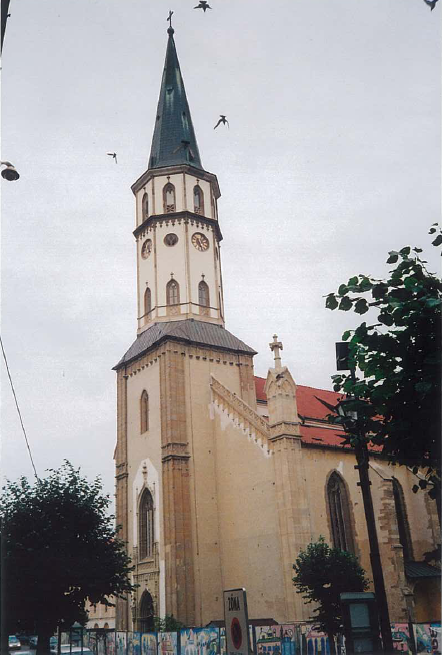 The church brings up memories of the line in the book, something like “It was an old church and some of its icons were missing but such churches are the best for praying in”. Remember Patrick White quoting that on the frontispiece of one of his novels? Outside town are the remains of the monastery that figures in the book – only one nun keeps watch here today – and where he received advice from a monk on the death of his son. The monk’s words he put into the mouth of the memorable saintly Zosima in his novel. Who is your favorite character, I asked Natalya Dimitrivona Shmeloyva who has been director of this house museum since 1981. She said Dmitri, the elder brother, because of his inner force, his energy. I guess she also means his turbulence. This is a very considered reply, as those of you who have read the novel will appreciate, and she gave it without pause. I said mine was Ivan. She immediately indicted Ivan. She claims he did not prevent the murder of his father by his half brother, merely saying “A snake will kill a snake”. She said Ivan does not accept God’s universe. Correct, because he says he says he cannot accept any divine plan that allows the suffering of children. She said he never liked anyone – and then conceded he clearly liked his younger brother Alyosha (note the name Dostoevsky gave the gentle, kindly younger of the three brothers, the monk in the local convent). She said he may have even persuaded his half brother, Smerdyakov, that God did not exist and is therefore responsible for the death of his old father (I have strong objections to this view). You should consult my own, My Reading Life, if you think you need assistance. I could have done with it. That’s why I wrote my book. In the same day that I inspected these sites and had this conversation about literature I talked at dinner about the fate of Russia’s second army in 1942 in the forests of the Novgorod region. Ninety thousand men starved to death, clawing at tree bark, with the Germans surrounding them. A Russian general, Vlassov, defecting to the Nazis. What a day when you can have these conversation, onion domes above the trees in the distance. A short drive south from Petersburg and you are in an extremely interesting historical centre. Here was the cradle of the Rus nation, first mentioned in 859. 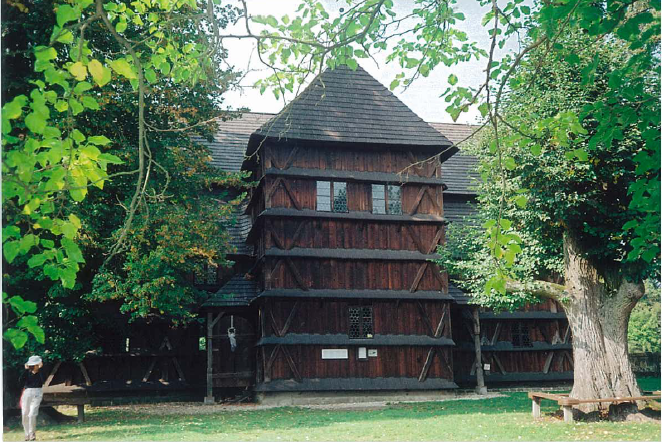 Here a massive medieval trading centre where the Hanseatic cities linked up with the Orient, merchants travelling in rivercraft all the way to the Black Sea and the Caspian, supplying Germany its furs and its honey and silks and spices. 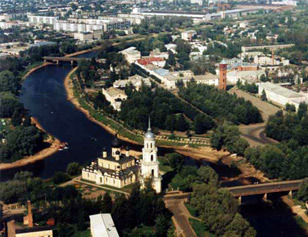 Novgorod the Great was a medieval power. 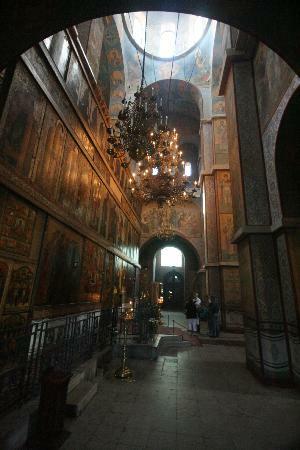 A couple of hours ago I stood in Russia’s oldest church, St Sophia’s cathedral in Novgorod’s kremlin. From its foundation in the 11th century it delivered the first Russian translation of the Bible, nurtured the first Russian library and had Greek priests train the very first Russian priests. As Rachel Polkonsky noted in her recent book, Molotov’s Magic Lantern ( see book reviews ) there is an air of sadness about Novgorod. 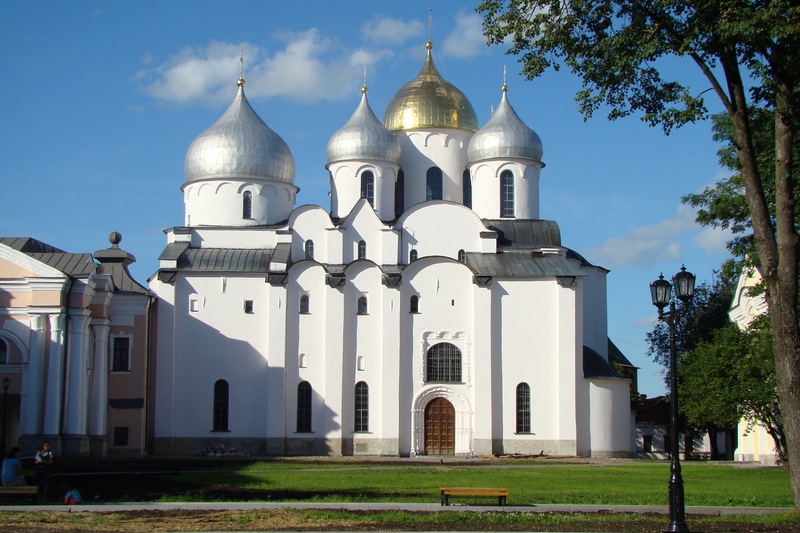 Of the 150,000 icons in Novgorod before 1917, the Bolsheviks left only a few thousand for the Germans to steal. And as we toured the area to visit monasteries we heard stories of blown-up church buildings, of German horses being stabled in St Sophia and mass execution of civilians. That this was the front line made the savagery worse. Scholars, including the great Dmitri Likhachev who worked in the area in the 20s and 30s, had chronicled the icons and the church histories even against the wishes of the party. He did time in the first Gulag on Soloviki Island – I remember Solshenitzn writing about this hell – for breaching materialist philosophy and taking too sympathetic an interest in earlier civilizations. Polonsky’s book is why we are here and if you come to St Petersburg you might press on south as well. And she’s got us going tomorrow to Staraya Russa for a day because of what she writes in another chapter of her book, this cultural travel guide. It was in this small town that Dostoevsky settled with his family and, drawing on what he saw in the town, wrote The Brothers Karamazov. 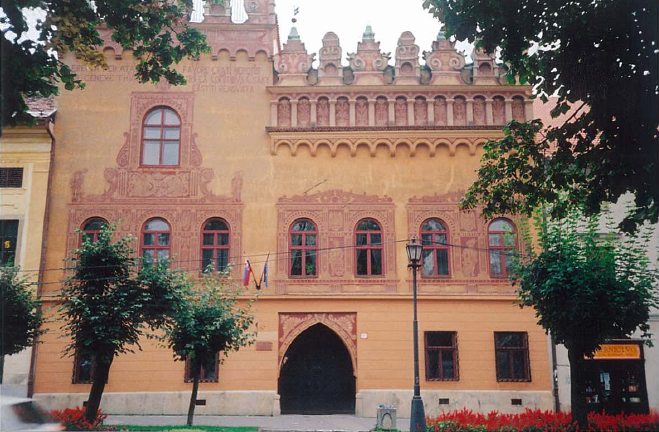 Twenty years ago Paul Keating told me me it was the most beautiful of Europe’s small palaces. Pavlovsk lies 40 kilometers from Petersburg and seeing it 20 years ago I saw what Keating meant and on Saturday, again after that long gap, I again knew Keating was right. It was finished in 1794, two years before the Emperor Paul 1 succeeded his mother Catherine the Great. That date prepares us for the celebration of French classicism it represents. Walking its relatively intimate spaces it is as if the finest of 2000 years of design and craftsmanship, of unvarnished good taste, were summoned up and displayed here. Take the chambers of peace and war – each on a side of the Greek gallery – for perfect interior design and decorative sense. Or the stunning entrance hall with its curtained galleries above you from which you start your tour: all is refined classical themes blending to create a heavenly alternative universe. 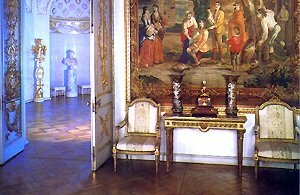 As crown prince Paul and his wife Maria Feodorovna toured Europe and collected the art and concepts displayed here. 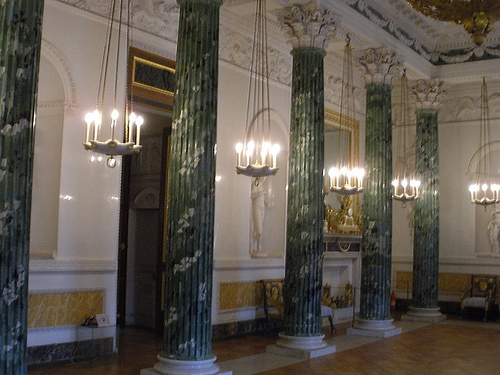 They acquired, for example, the largest collection of ancient marble statuary outside The Hermitage. The statues fill every niche and a long gallery as well. 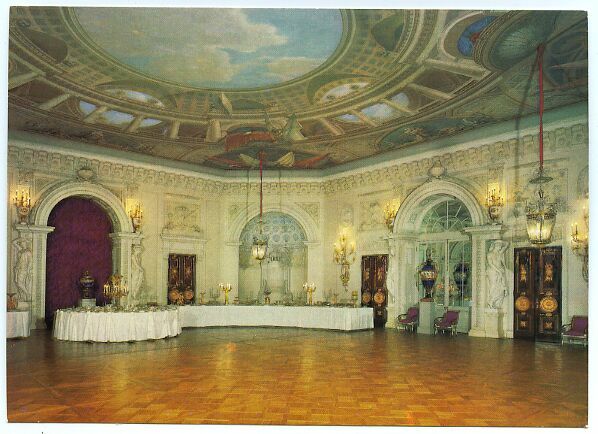 The genius architect Cameron planned it all, down to the door knobs but there is none of the pomposity of the baroque palaces of Catherine 1 or Peter, that is, of Catherine 1’s Palace at Tsarskoe Selo or of Peter the Great’s at Peterhof, or of the baroque or Petrine mansions in Petersburg city. Normal story- it was smashed up in World War Two, falling within the German lines, but the loving Russian curators had stored and buried and carted off the treasures – one Greek statue had been too heavy and was too heavy as well for the Germans to destroy so it survived, standing up in the gallery. Then, the painstaking restoration after the war, communist tradesmen recreating the workmanship of their serf craftsman predecessors to rebuild this monument to delicate royal taste. From the outside, an Italian villa, two stories. That’s all you see. 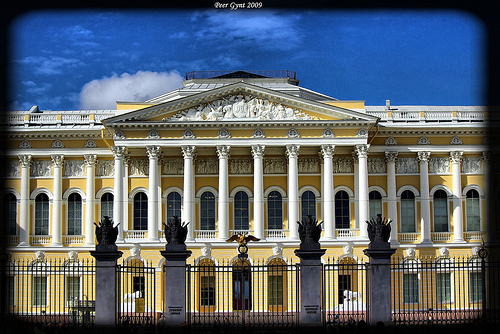 The characteristic yellow and white of the Russian style, colonnaded galleries. Masterpiece. Paul was nearly disinherited by his brutal, murderous mother on her death bed and then strangled by members of a court clique in 1801 to make way for his son who became Alexander 1 and who was to rule until 1825. His tomb – tha is, Alexander’s – has turned out to be empty, mysteriously. Tsarist history is pretty ripe. See the 2003 Lenfilm production, Poor, Poor Paul directed by V Mel’nikov, one of the films unveiled at one of my Russian film festivals a few years back. Suzanne Massie has written a history of Pavlovsk which I bought here and which looks very good. By history I mean right through 1917 when the comrades quickly made it a museum and through the war-time desecration and post-war restoration. 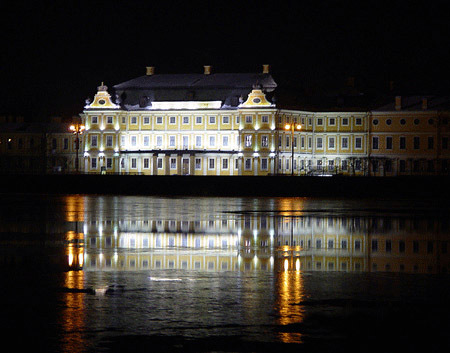 Strong Carr recommendation here, backed by my mate the former PM : of the Petersburg royal palaces make this your first choice. It has to be one of the most evocative museums I’ve visited. 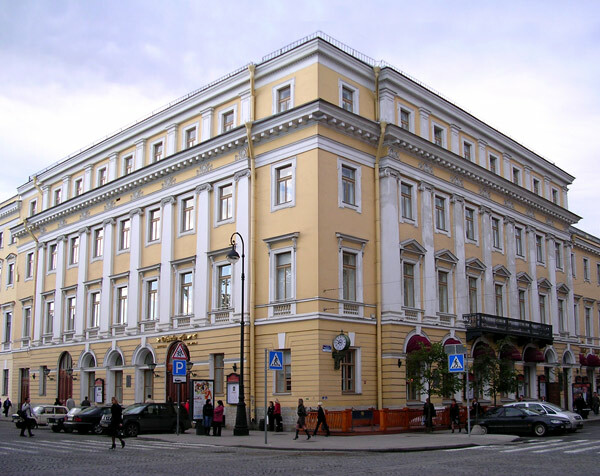 On the Petrograd side of Petersburg, north of the Neva, there is a district of Art Noveau apartments that was fashionable before World War One. At 26-28 Kamennoostrovsky Prospect you find the solid apartment block put up between 1911 and 1914 by Russia’s first insurance company and nationalized after the October coup or putsch ( it was not of course, a revolution ). 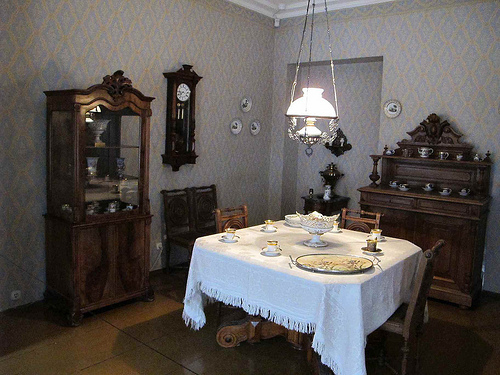 In 1926 the five-room apartment 20 was given to Sergei Kirov, the party first secretary for Leningrad. He was an up-and-coming Bolshevik, raised in an orphanage and with a background as professional revolutionary. He was becoming very popular as the boss of this city. While he was close to Stalin, Stalin may have felt threatened after Kirov polled better than he in a party ballot for Politburo membership. 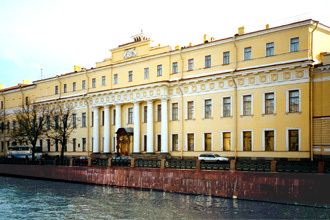 On December 1 1934 Kirov was shot in the back of the head while at the Smolny Institute headquarters of the party. The assassination led to Stalin inaugurating the Great Terror. Kirov's well appointed kitchen. Not pictured is his GE fridge. It is fascinating to inspect in detail the private home of a Bolshevik big-wig. It contains an office with two walls of book cases – party reports mainly – hunting trophies, four phones – one a direct line to you know whom. The furniture here and in the library, dining room and bedroom is expensive. Art Noveau pieces among them. It had been confiscated from enemies of the new regime. The kitchen contains a General Electric refrigerator which would have been one of five in the city at this time and would have cost the equivalent of two Fords. Stalin certainly seized on Kirov’s murder to eliminate much of the party’s leadership with the Great Terror, the purges that eliminated millions. But did he arrange Kirov’s murder? There was enough in the background of Leonid Nikolayev, the killer, to explain the deed. And little advantage in it for Stalin. The old story : the fringe world of politics is inhabited by disappointed office seekers and frustrates who at any moment can go off the rails as their border-line conditions worsen. Known a few myself. Anyway the cattle cars from Leningrad to Siberia were full for seven years. And it was the shooting of Kirov that sparked this rage of the Marxist state against its own people. Hence the fascination of this house museum, in a block that once had the apartments of Zinoviev and Shostakovitch as well. In space acquired from an adjacent apartment the curators recreate Kirov’s office from the Smolny Institute right down to the phones, ashtrays and portraits by artist Brodsky of Lenin and Stalin, easily the most human of this genre that I have come across. The tomb of Tsar Nicholas II in the St Catherine chapel. Then we walked down to the Russian political history museum in the palace of the prima ballerina Mathilde Kschessinska who had been set-up by Alexander III to tickle the fancy of his son, the crown prince, later to become Nicholas II. In 1917 the Bolsheviks grabbed this building and Lenin addressed crowds from the balcony. Today a fabulous collection of Soviet nostalgia. Then to the Peter and Paul Fortress to see the tombs of all 18th and 19th century Tsars including the inspiring ones, Peter the Great and Alexander II. In a chapel off to the side sleep the murdered Nicholas, Alexandra and two daughters, with a boy and girl – their bodies recovered and identified – soon, I guess, to join them. Everywhere, in this city, one’s reminded of the peoples’ tragedy of Russian history. The Kirov museum brings it home eerily. Guess there will be time for The Hermitage. Read Simon Sebag Montefiore’s The Court of the Red Tsar on Stalin, or Martin Amis’s punchy polemic, Koba the Dread. Perhaps as well Robert Conquest’s The Great Terror, a book from 1968 which got to the truth of Stalin before most. Instead of spending a weekend in Maroubra reading about the country I’ve come to it. And spent the weekend walking through Russian history. Yesterday began with the home of Anna Akhmatova, now a small museum, the apartment where the poet lived from 1918 to the 1952. Here she was present when two husbands were arrested by the secret police. Both were to die in the camps. From here she took parcels to the prison queues for her son, also arrested (he was released, fought with the Red Army to Berlin and, after the war, was rearrested ) – the queues in which a blue-faced woman, freezing, asked her in a whisper to tell their story for posterity. From the garden courtyard below the apartment secret police looked up at her windows and required she present herself at them once a day so they knew she had not suicided. Here she met Isaiah Berlin in 1945 when he worked for the British Embassy. The sleuths had a listening device planted crudely in a boarded interior window. The others who shared the flat may have listened at her door to hear whether she was whispering new poems to any visitor. As the persecuted poet and her friend Osip Mandlestsm noted, “Poetry is respected only in this country – people are killed for it.” There is no place, he added, where more people are killed for it. The flat has been recreated as it was in the 1930s, with a room added to display material such as letters from the prisons and her beseeching letter to Stalin. That’s what all the families of the victims did : write to the higher-ups. Visiting here is like pressing your face up against the Marxist state that was in a rage against its own citizens during these appalling years. This tyranny crafted to implement the sweeping, unitary notions of the angry theorist, with Stalin as loyal adherent prosecuting the Marxist dream. 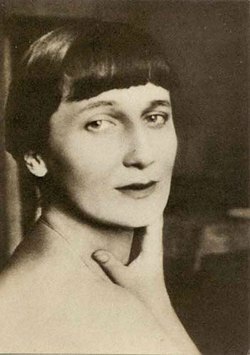 Anna died in 1966 and saw her poems printed again in the thaw that follow Stalin’s death. Then a half hour walk in perfect autumn weather to the Dostoevsky House Museum created in the modest five room apartment where the author lived from 1878 until his death in 1881, years of comparative prosperity and indeed of renown and approval. Here you see a page of The Brothers Karamazov in his wife’s shorthand, here a note from one of his two surviving children slipped under his study door when he was sleeping after a night of writing. From the desk in his study he looked up at a framed photo of Raphael’s Dresden Madonna and his desk is obsessionally neat. He smoked non-stop as he mapped out his chapters on thick paper for daytime dictation to his wife. From the two story window one looks down at a street that had been one of tradesmens’ workshops. Why did I, young fool as I was, wait till my 50s before reading this man instead of letting his stories flood my bloodstream in my 20s ? Intellectual laziness. See my book, My Reading Life, for a helpful account of how to start Dostoevsky if you are like I was. Yes, you must read him, not just expect to absorb him by osmosis. On the metro to lunch in a canal-side vegetarian restaurant called The Idiot only a short distance from the Yusupov Palace. Here one of the country’s richest most aristocratic families basked in its art and entertainment ( the palace has a private theatre used today ) and its links with the court. To its cellar its son Felix and his friend Dimitri Romanov, nephew of the Emperor, lured Rasputin in 1916 . In a comic-macabre comedy of errors they assassinated the peasant and dumped his body in the ice. 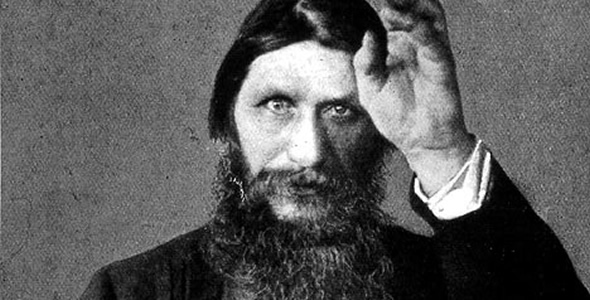 Rasputin was just a peasant with psychic powers, not a monk or a priest. He may have used hypnosis to help young Alexis, the heir to the throne, to lower his blood pressure and survive the symptoms of heamophilia that threatened his life. Rasputin’s image – all the stories about orgies – may have been manufactured in the court hostility his presence in royal circles aroused. St Petersburg is serviced by an old-fashioned, distinctly small airport from which you can emerge very quickly. It is close to the city. The town is apparently safe. We certainly feel at ease walking around. It is markedly cheaper than Moscow. Buildings are slowly being restored. And there are no horrible eruptions of unsympathetic buildings in the harmonious streetscapes, stretching in all directions. Walking through history indeed. Out of Vienna and down the Danube into the Wachau and the wine town of Durnstein, commemorated in Tolstoy’s War and Peace as a battle scene in the 1805 war with Napoleon, the outcome reported by Prince Andrey to the Emperor. 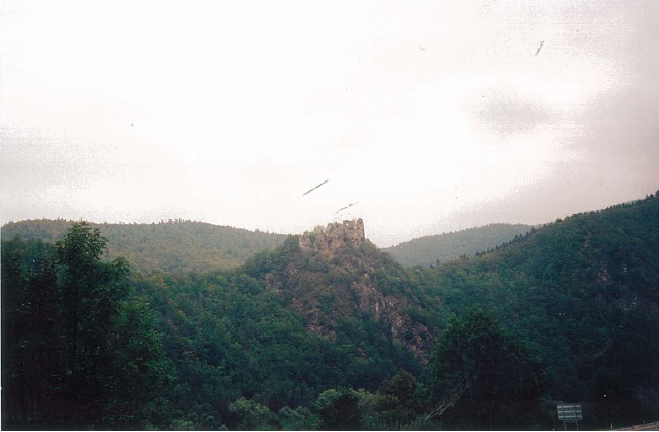 A ruined castle above us and the family schloss which replaced it in the town, terraced vineyards on the slopes. 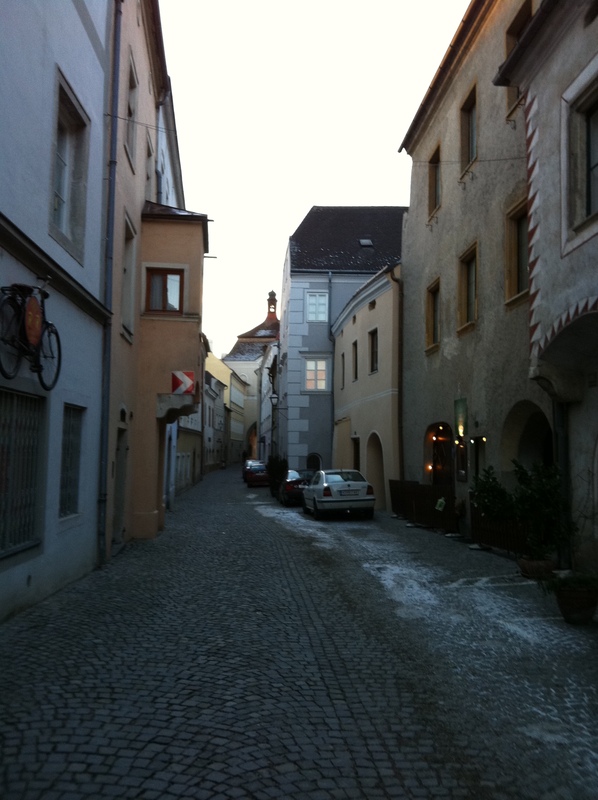 Then to Krems on the confluence of the Krems and Danube, an extensive town with so much intact of its churches and streetscapes it gives an intoxicating illusion of time travel. 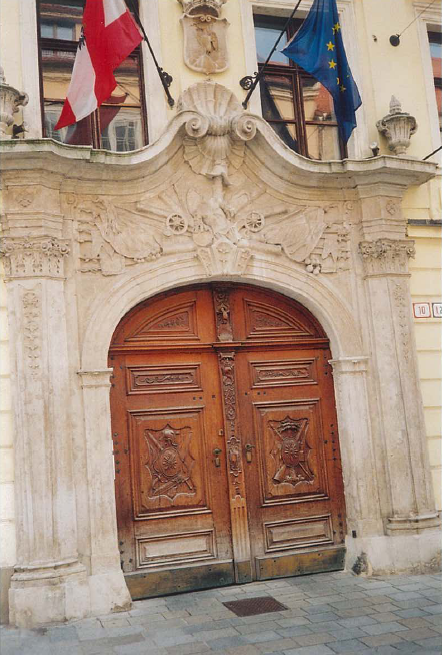 Face the Steiner Tor, the medieva l gate, from the outside and instead of entering the shopping district turn and go in the opposite direction to residential streets straight from the baroque with some Renaissance facades thrown in, a petite rival to Prague in its perfection. It has, it seemed to us, countless churches, one converted to be a stark war memorial to the dead of both world wars and to the victims of Stalingrad from lower Austria. To the victims of Stalingrad on the invader’s side.I could have lingered in the little squares looking at the facades, strolling the medieval street pattern. This is a discovery. Mark it well. 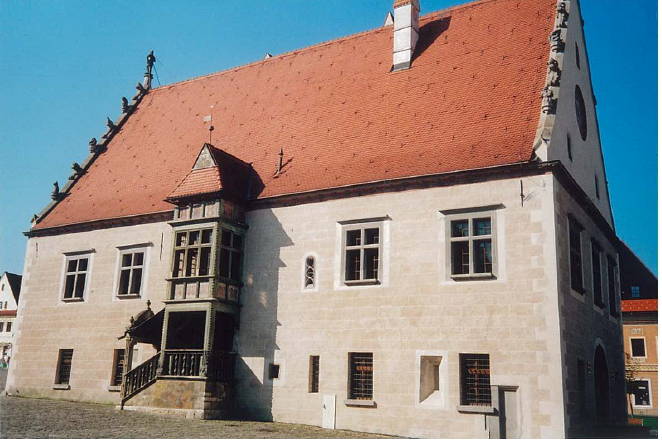 In terms of architecture and design it is less overwhelming than nearby Melk with it’s spectacular library, banquet hall and chapel. Melk would be the superior experience. 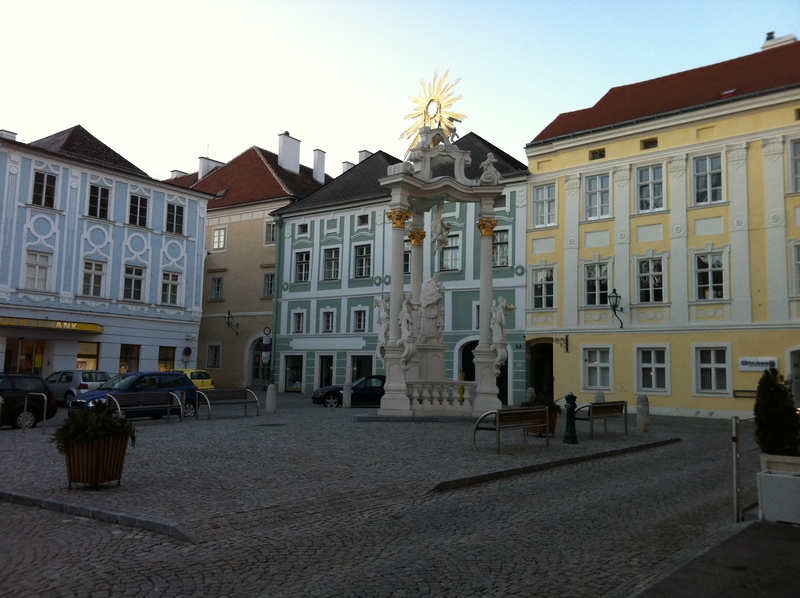 Austria’s Catholic landscape, I reflect, with its great wealthy baroque monasteries lavishly decorated, all within a day’s journey of each other…it confirms the reality of Holy Roman Empire which is what the Habsburgs called themselves until 1806. Vienna offers an exhibition at the Albertina of Michaelangelo’s drawings, made for his big commissions… from the competition with Leonardo for portrayal of the Battle of Cascina in the Palazzo Vecchio made in the 1490s ( the decoration has vanished and we are left with these drawings ) to the grandiose tomb planned for Pope Julius ( completed on a modest scale ) and the Last Judgement and the earlier Sistine Chapel ceiling. One’s surprised so many of these – executed with ink and red and black chalk – could possibly have survived . As for the Sistine, I’m intrigued by the artist’s absolute insistence on only Old Testament figures for the ceiling, a celebration of Jewish history and mythology with Greek sibyls thrown in, not a solitary Christian figure on view. Never thought of this ? Check it for yourself. And this in the heart of the Vatican. Michaelangelo was one of the great pro-Semites of history, full of a love of the Jewish prophets and their stories, and something in the neo-Platonism of his Florence – the philosophy circulating around the Medici court – has to explain it. 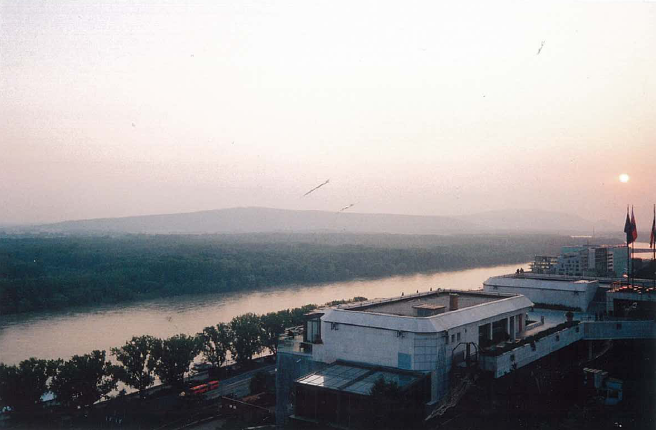 Start in Bratislava on the northern banks of the Danube, within sight of Vienna, historically beyond the limes Romanus, the border of the Roman world. 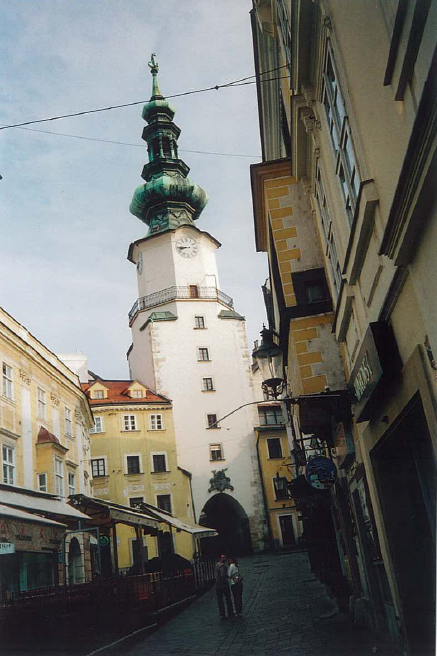 Bratislava features plenty of architecture of the Austro-Hungarian Empire plus some of the gloomy communist past. 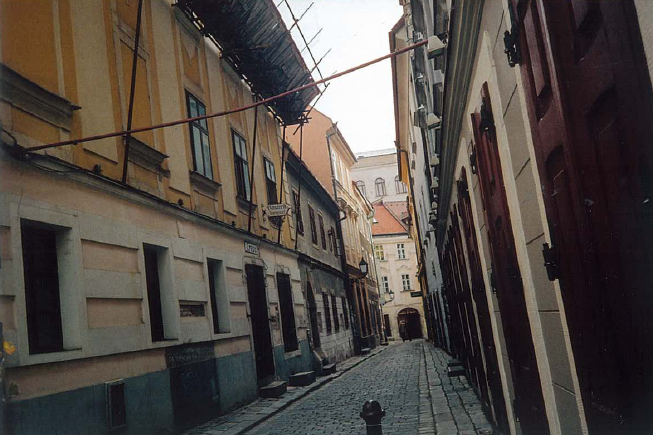 There are constricted alleyways and facades that will remind you of Mozart’s era. 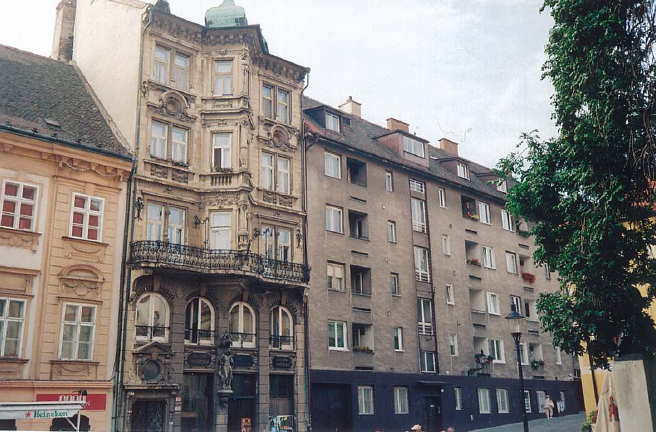 On one street three buildings are, sequentially, of the Baroque, the Jugenstil and the Communist eras. 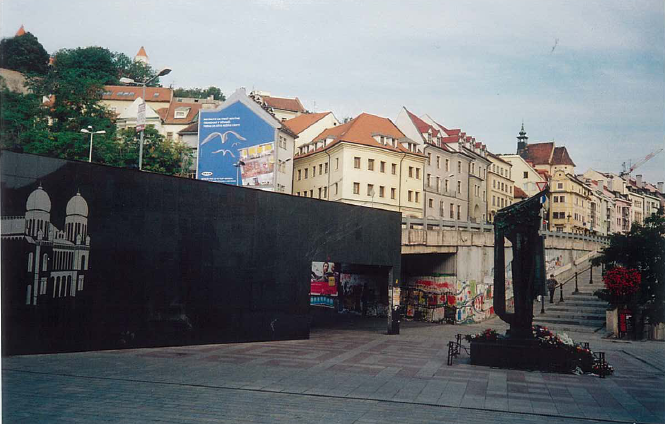 Opposite lies the site of the Bratislava synagogue destroyed by the Nazis. On the castle hill aficionados like me of Cold War history will find the monument to Alexander Dubcek, the Slovak-born leader who challenged Soviet hegemony over Czechoslovakia. His movement was crushed and he overthrown when a half million Soviet troops invaded in 1968. 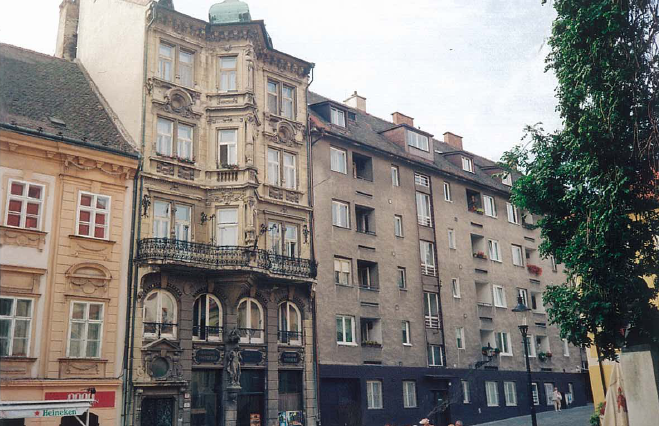 The site of the Bratislava synagogue. 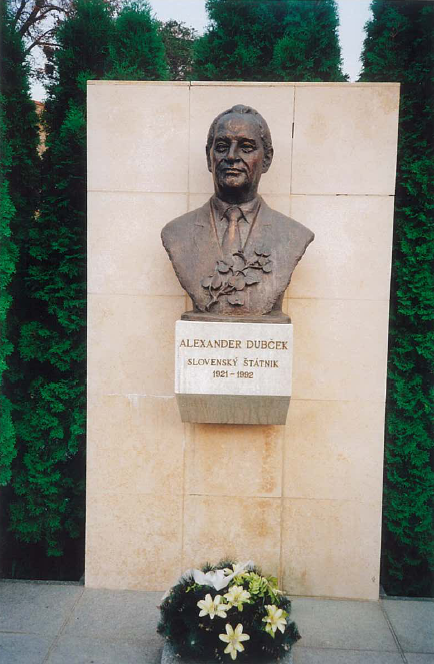 Alexander Ducek, killed in a car accident in 1992. 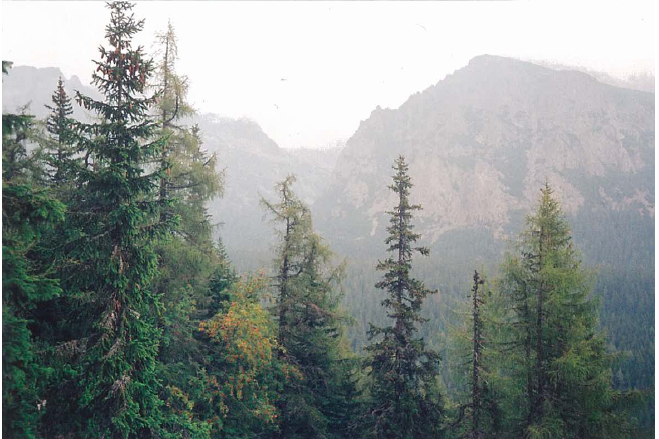 The drive from Bratislava to Tatranska Lomnica brings you into the High Tatras with this fairy tale forest scenery. 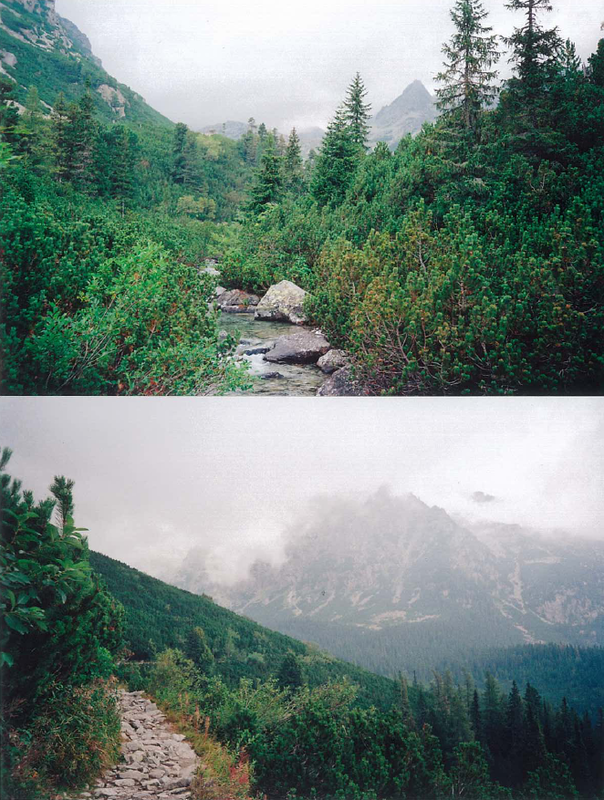 If you press further along this path, hiking through the High Tatras, you would cross the mountain range and enter into Poland. 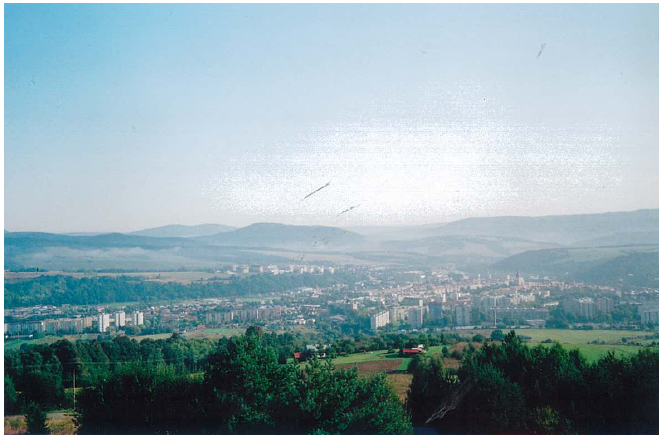 September 13: The drive from Bratislava from Tatranska Lomnica. Spisska Sobota is a picturesque part of Poprad, the administrative and business centre of the region under the High Tatras. 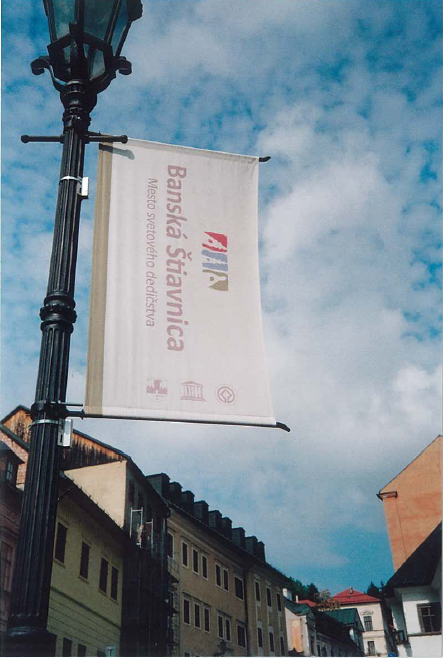 The first mention of the town, on a northern Slovakian trade route, was in 1256. 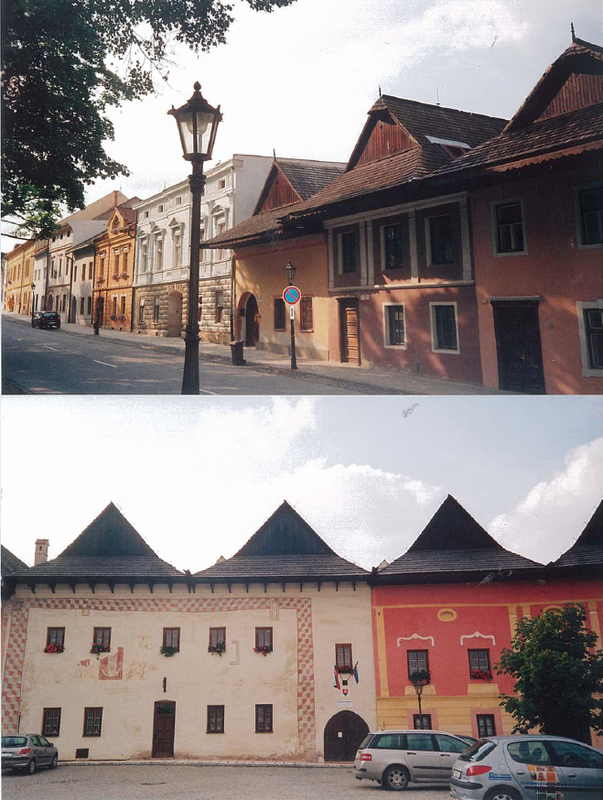 Spisska Sobota offers medieval and Renaissance facades, restored and distinctive. 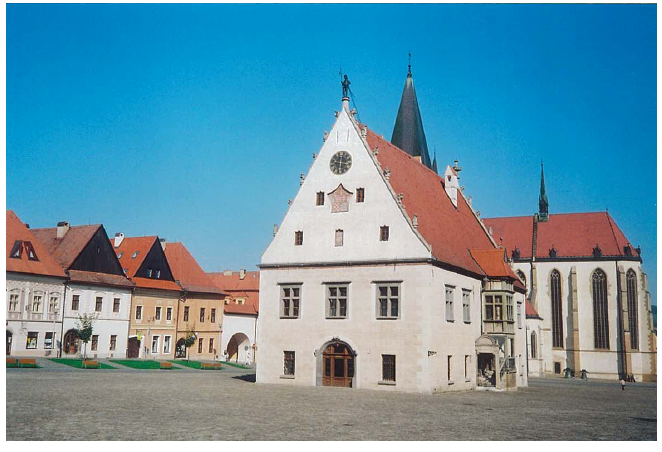 Bardejov is bigger, founded by German settlers in the 14th century and distinguished by intact stone walls and towers, a Rathaus or town hall from 1641 and the Cathedral of St Egidius, again in the German style. 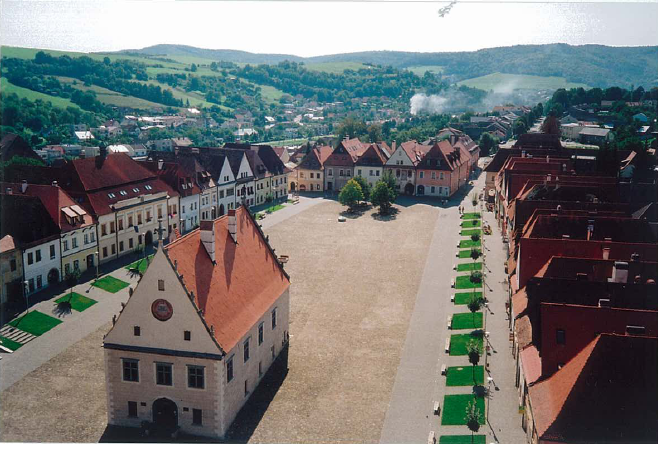 The main square has facades from the 15th, 16th, and 17th centuries. 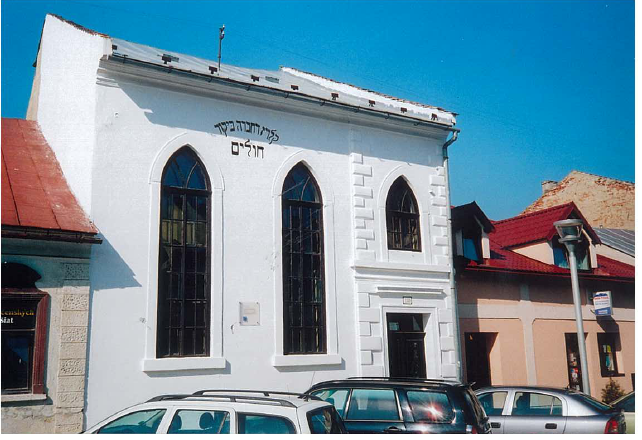 One block from the main square is a narrow-fronted synagogue of the 1920s which was opened for us. The Jewish deportations occurred, all over Europe, in 1942. What a word, deportations. You hand over the key to your house, struggle to the train with some luggage, leave in a box car. One third of the population of this region was Jewish. Few returned. 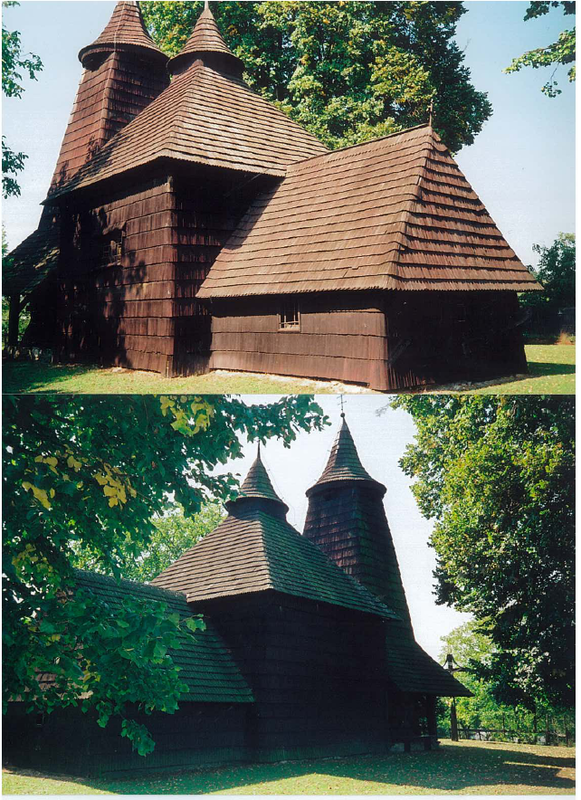 Wooden churches – like Bardejov itself, UNESCO listed – are a feature of Slovakia, as Trocany – seen below– exemplifies. 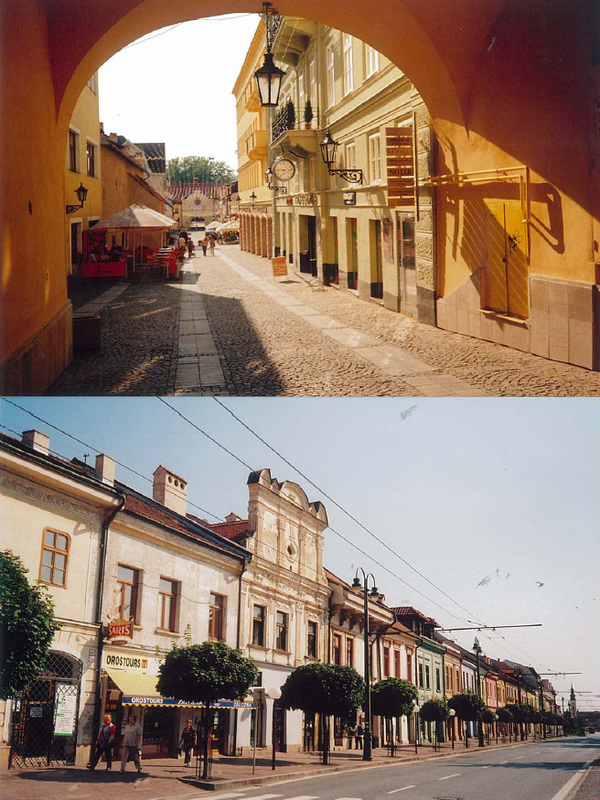 Presov is the third city of Czechoslovakia. 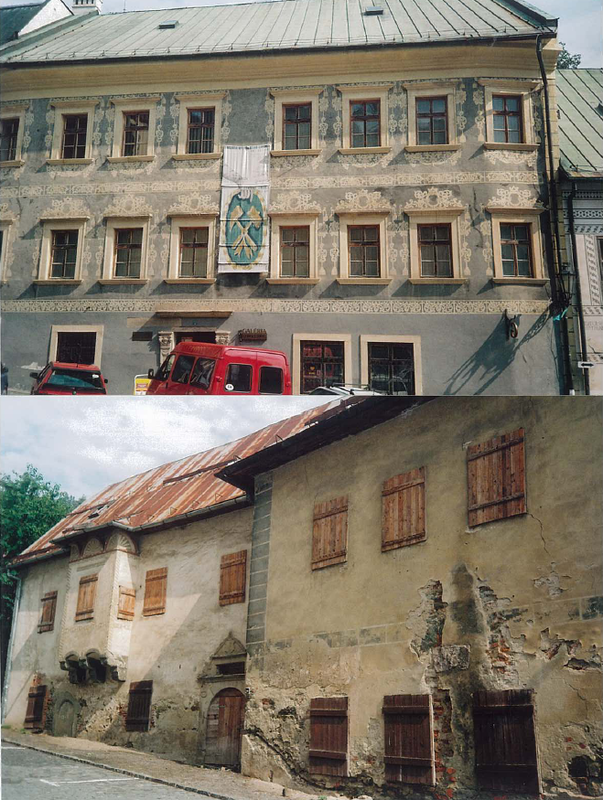 It’s an invitation to make an historic movie, offering an intact main street from imperial times, with one 17th century burgher’s house decorated with graffito. 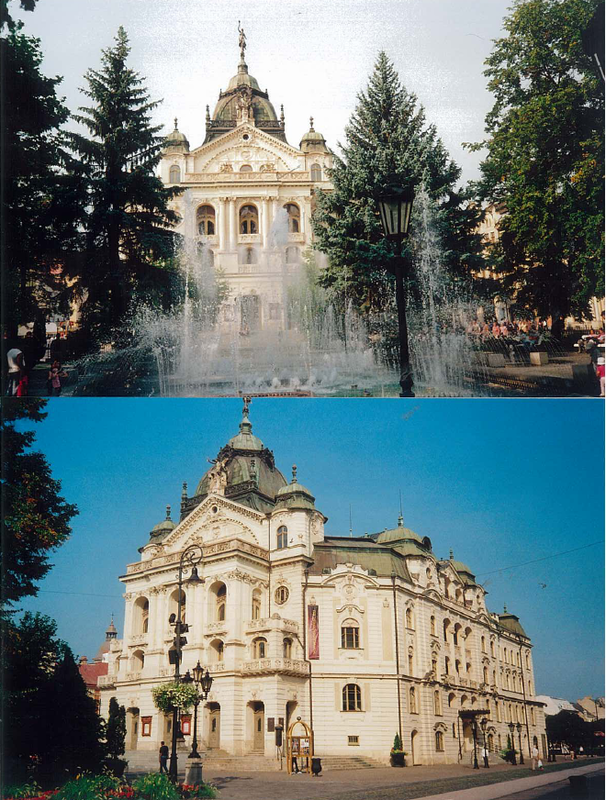 We stayed in Kosice, the second largest city and the centre of eastern Slovakia, founded by German colonists after the Tartar invasion and part of Hungary for a thousand years to 1918. Like other imperial cities it features a opera house and civic buildings. 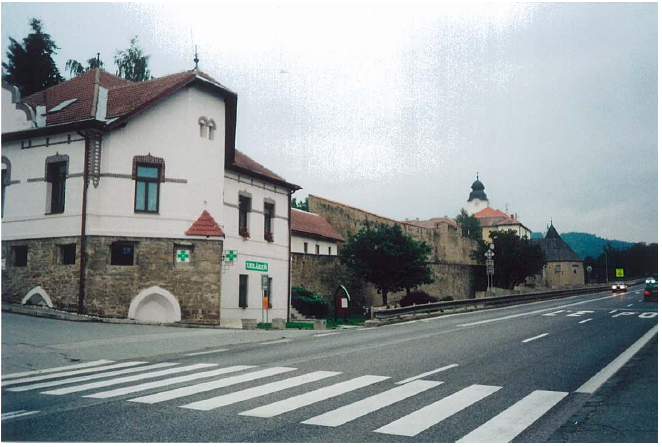 The great Russian general Kutuzov stayed here returning from Austerlitz. 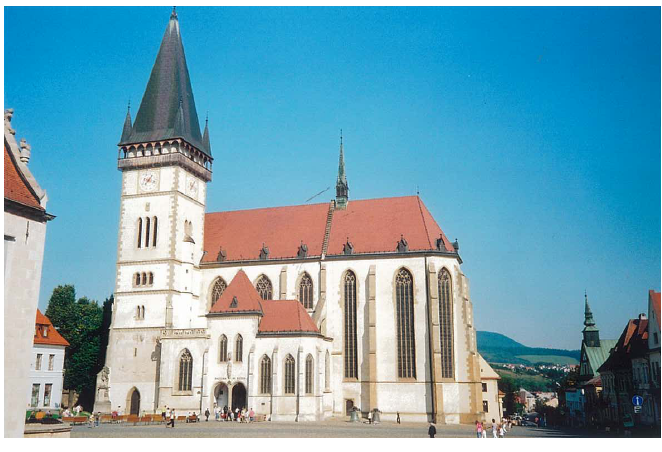 Levoca again features this mix: a cathedral in the German style founded by German colonists, Renaissance and Baroque facades with painted decoration, a city wall, a Rathaus – all evidence of German colonisation. 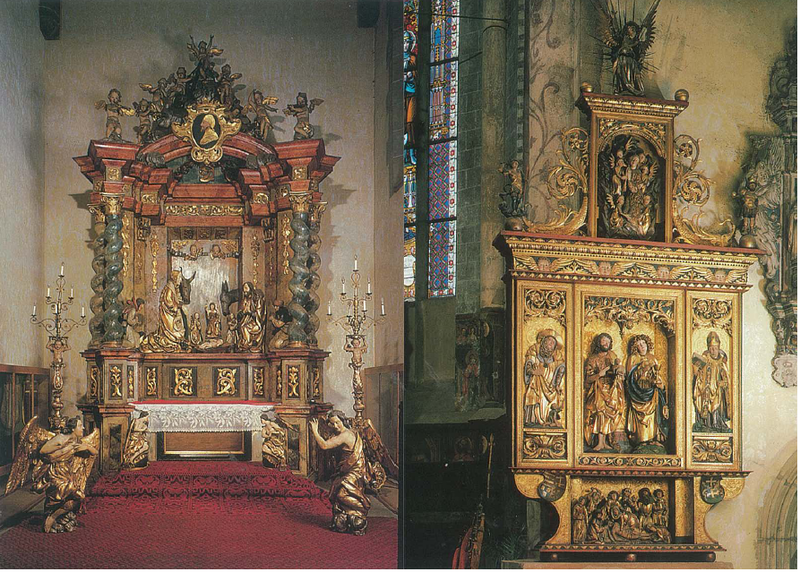 It was the home of the master painter Paul who was responsible for the largest wooden altar in the world in Levoca cathedral. 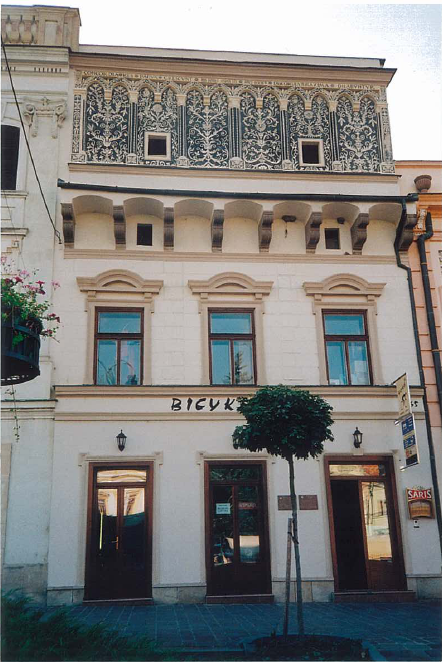 Renaissance and Baroque facades with painted decoration. 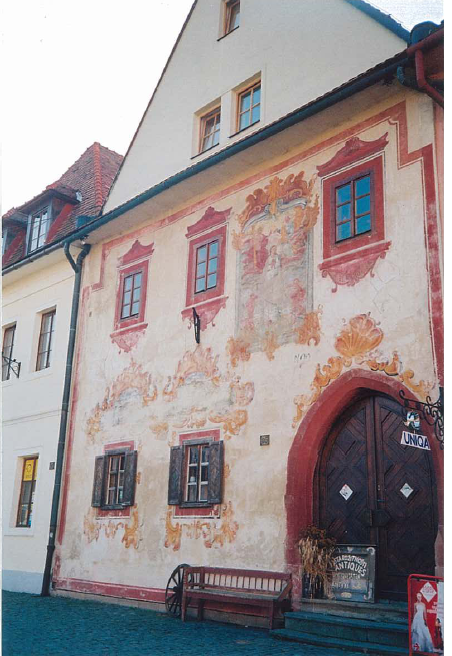 The home of the master painter Paul of Fuggers in Levoca. 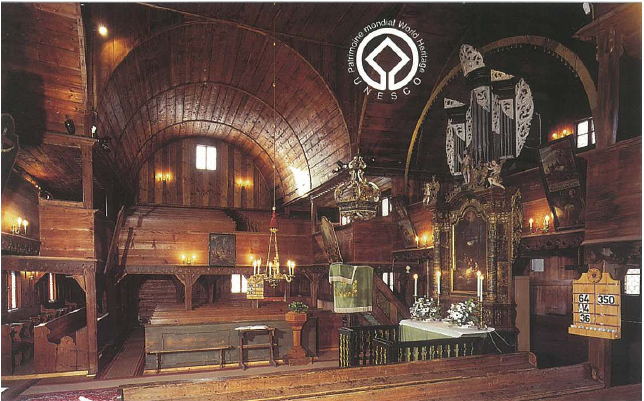 Below, pictures of the largest wooden altar in the world. 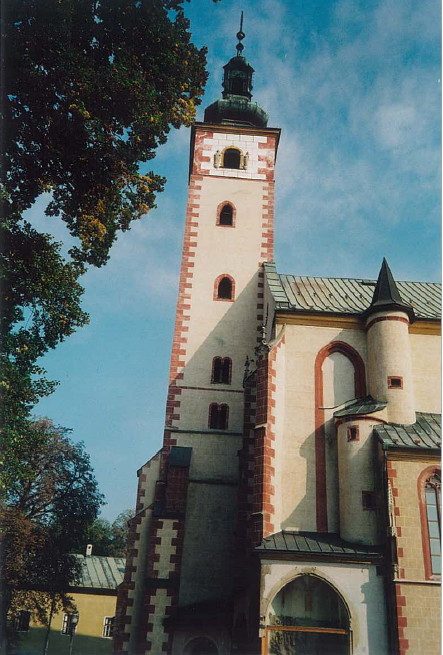 More fine architecture in Banska Bystrica and, again, a German style church and on the outskirts a wooden church (1725) allowed by the emperor, but – because it was Protestant – denied nails, any metal, or a steeple. Also UNESCO listed. 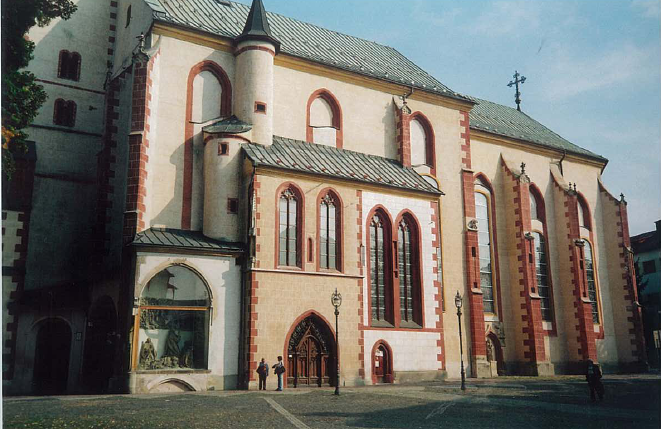 A 1725 Protestant church, allowed by the Emperor but denied nails. Below an interior shot. 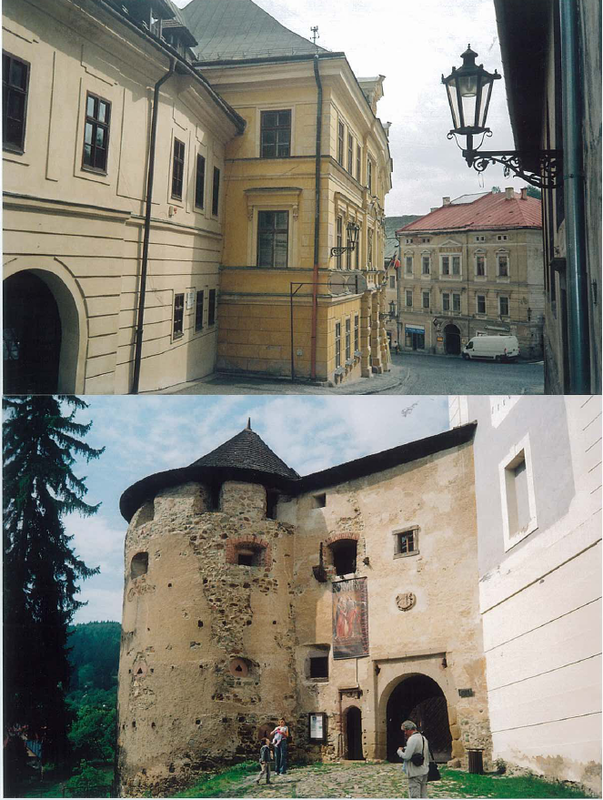 The extraordinary level of preservation was confirmed in Banska Stiavnica, an ancient mining town. 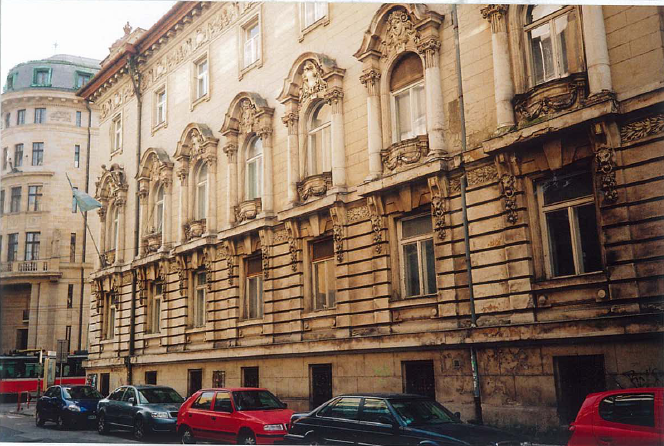 Just look at these streetscapes – absolutely intact! Like time travel, levitating you back to the Austro-Hungarian Empire. 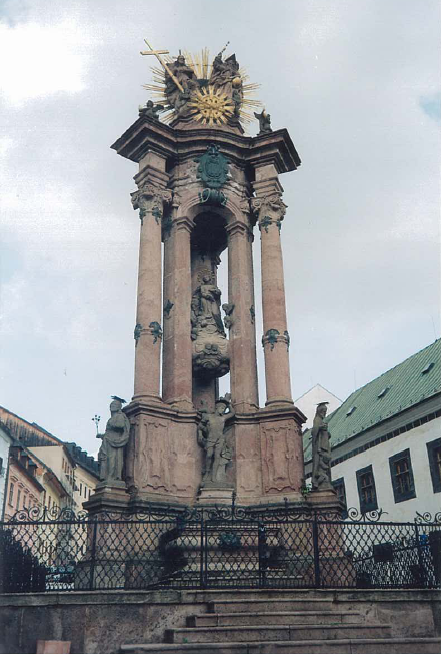 Note the city wall; the Baroque and Renaissance facades; the column celebrating deliverance from plague. 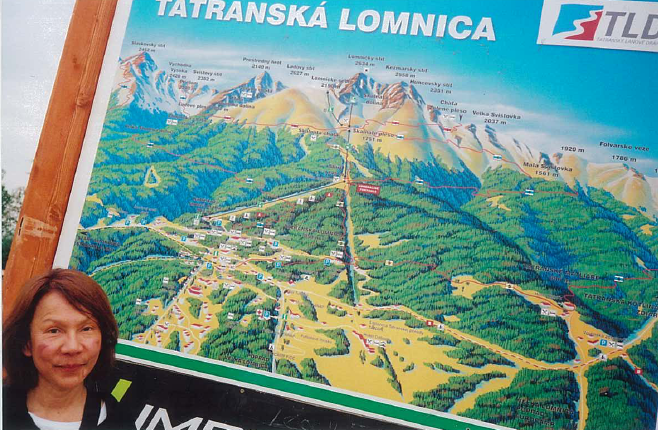 Slovakia is relatively unspoiled and it is relatively cheap. Don’t go if you are a foodie: I had to track down grilled salmon as an alternative to pasta and pizza. Go if you want to walk through an alternative universe of un-wrecked facades and un-bombed, intact cathedrals. 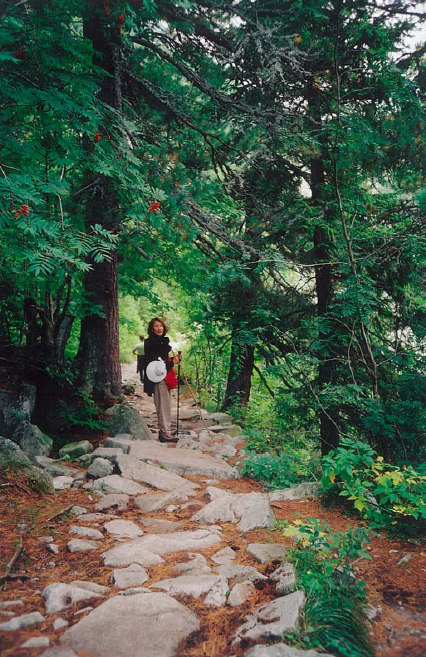 The hiking is good although the tracks were heavily used. Transport. 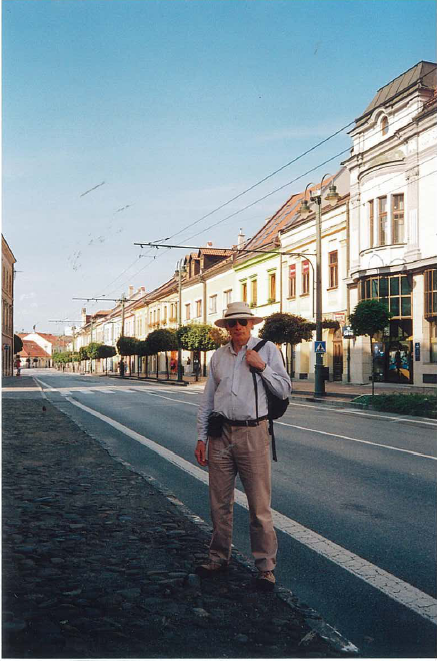 We contracted Peter Blazicek of Best Slovakia Tours, a terrific guide to drive us around for a week. The cost depends on the number of people and the standard of accommodation you request. He is very flexible and will make arrangements according to your needs. The hotel accommodation was flawless. Peter found us specialist guides when required. We recommend him wholeheartedly. 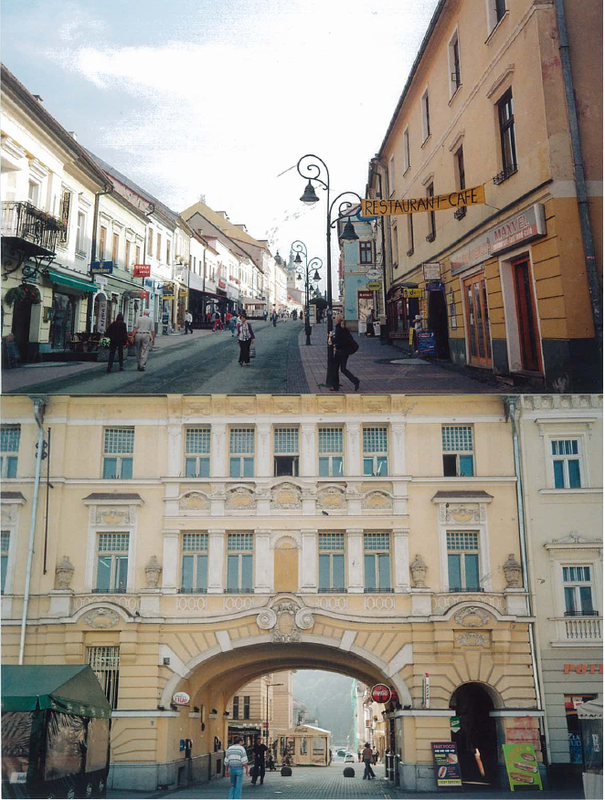 In the quest for un-wrecked corners of Europe, streets without intruding modern buildings and all the rest, Slovakia rates high. Very interesting photographs and comments. We are going to Moscow and St Petersburg next year, so your valuable insight into where to go and what to see is most appreciated. Living in Slovakia, it was funny to me to see my friend’s car parked in front of his house in Levoča! I would say this about food though– you are right that you have to hunt, but I hope you at least got to some of the Koliba’s and Šalaš’s that have somewhat traditional Slovak food. One problem with food in restaurants here though is that there is a real lack of creativity– there is more than just pizza restaurants, but then 90% of the other restuarants seem to have about the same thing on their menus– wiener shnitzel, hungarian gulusch, garlic soup, etc. By the first sentence above, I meant seeing his car in your photograph!